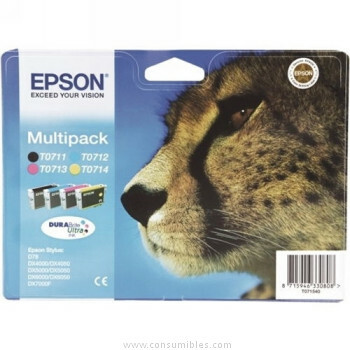 El pack 2 cartuchos de tinta de la marca Epson referencia C13T07154012 esta diseñado para ser utilizado en impresoras Epson como Stylus CX 4300, Stylus D120, Stylus D78, Stylus D92, Stylus DX4000, Stylus DX4050, Stylus DX4400, Stylus DX4450, Stylus DX5000, Stylus DX5050, Stylus DX6000; Stylus DX6050, Stylus DX7000F, Stylus DX7400, Stylus DX7450, Stylus DX8400, Stylus DX8450, Stylus DX9400F, Stylus Office B40W, Stylus Office BX300F, Stylus Office BX310FN, Stylus Office BX600FW, Stylus Office BX610FW, Stylus Office SX205, Stylus Office SX210, Stylus Office SX215, Stylus Office SX218, Stylus Office SX400, Stylus Office SX410, Stylus Office SX415, Stylus Office SX510W, Stylus Office SX515W, Stylus Office SX600FW, Stylus Office SX610FW, Stylus S20, Stylus S21, Stylus SX105, Stylus SX110, Stylus SX115, Stylus SX200, Stylus SX205, Stylus SX210, Stylus SX215, Stylus SX218, Stylus SX400, Stylus SX405, Stylus SX410, Stylus SX415. 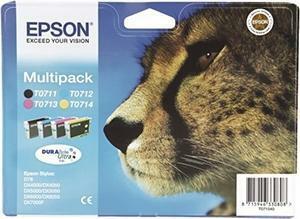 Con consumibles originales siempre obtendrá los mejores resultados en sus impresiones. 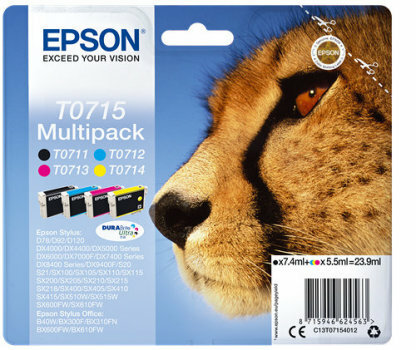 Los cartuchos originales como la referencia (C13T07154012) se han diseñado cuidadosamente por Epson para funcionar con su impresora, con el fin de ofrecer una alta calidad de impresión y una fiabilidad inigualable.